Busy all the time and on the go? Feeling stressed, anxious and/or sad? Overwhelmed by daily duties and responsibilities? Wish to take more action for self-improvement but feel to exhausted to invest more time or additional effort? Find meditation dull, confusing, frustrating and challenging? Feeling stuck, discouraged, and/or beaten down? Wish there was something you can do to empower yourself without taking you away from your responsibilities? If you answered yes to any of these mentioned above. This retreat is for you. 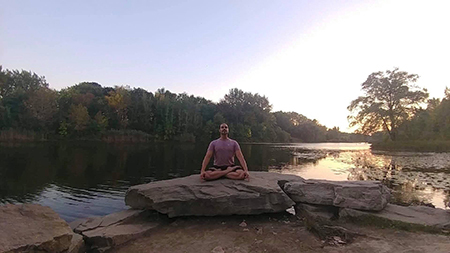 Join us at the lovely landscapes of the Eastern Townships at Babaji's Kriya Yoga Ashram in Quebec, Canada just 1 hour and 30 minutes from Montreal. Located on 80 acres, atop a mountain, with panoramic views of neighboring mountains & pristine forest land. It has a private lake, access to hundreds of acres of forest trails, & the peace of isolation. What is a retreat and its purpose? RETREAT: withdraw to a quiet or secluded place. To retreat is to simply step away from the context of our daily habitual life patterns to gain clarity on the causes which may be interfering with our well being physically, psychologically, emotionally and spiritually. Nature has the ability to heal and reconnect one to the ever blissful, peaceful, healthy, calm nature of the pristine Self Within. Otherwise known as our "Original State". What is this retreat all about? This retreat is open to all levels of ability with or without experience. From the novice to the experienced. The main objective is to provide paricipants the necessary understanding on living life consciously among the context of daily duties and responsibilities from a simple yet profound approach. Allow my "Self" to share with you how simple it can be to claim back your sovereignty within the life you are living no matter its context. Transform from mechanical living of just going through the motions of expected duties, to a life of "Conscious Living For Happy Living". What will this retreat comprise of? *This weekend is open to ALL. No matter the level of experience. Friends and spouses are welcome. Peter was inspired and curious by the Eastern Arts, Philosophy & Psychology ever since the young age of 8. From the Ages of 8-20 Peter practiced & studied Karate, Kung- Fu, Chi Kung, Tai Chi & Meditation with great passion. At the age of 17-32 he was introduced to Bodybuilding & devotedly trained to further understand the effects on the physical & mental levels of the human expression. By the time he entered the Ages of 26 to his present age of 47 The Science of Yoga became a path he undoubtedly & intuitively knew was the way back home to the Light of Truth & Liberation from the societal conditionings, programs, beliefs & limitations veiling the ever indwelling naturalness of the "Original State" (Soul). Having had severe lower back problems at the age of 21 due to a work related accident. Bedridden and immobilized. He sought out medical attention for a year and a half to no avail. At the age of 26 when Yoga entered his life, a journey through self-exploration, attentiveness to the body's needs, observation of the emotional and psychological tendencies began his "Spiritual Surgery" back to recovery. Since then he has helped many suffering with back issues, ailments and other health problems adopt a practice in building self awareness of the body's needs to reclaim rapport and friendship with its eternal wisdom. Yogi Pgian received his TTC (Teachers Training Certification) in Kriya Hatha Yoga in 2003 and intuitively was prompted to study Yogic Scriptures such as Bhagavad Gita, Patanjali’s Yoga Sutras, Hatha Yoga Pradipika, Brahma Sutras & Various Upanishads. He has also practiced & studied Kundalini Yoga under the guidance of a teacher from India & was initiated into Babaji’s Kriya Yoga in 2011 & 2012. Yogi Pgian highly honors the Spirit (breath) & regards it as “The True Master to our Self Mastery”. Realizing the importance of educating the masses in proper relaxation & proper breathing methods. For it is in the Spirit that humanity can come to unite & return to the naturalness of “Being”, respectfully living harmoniously with one another, all of life & our fullest potential. He has since then come to gain much understanding and experience of the human organism through his many years of exploring numerous and diverse practices. Devising a unique yet simple approach for all levels of ability which has proved transformational life changing benefits among the context of daily living. Many who have come in his presence gained inspiration to enter into fields of spiritual development as a form of work. Per Person - $400.00 tx incl - Fees cover meals, lodging & curriculum. A $200.00 Deposit is necessary in order to reserve your place. Directions if you are driving from Montreal: cross the Champlain Bridge. Take the #10 AutoRoute (Eastern Townships AutoRoute) for 55 minutes, to Exit 100. Turn right and go 3 miles to the village of St. Etienne de Bolton. At the church veer to your right and take "rang de la Montagne" ("Mountain Road") up the hill for three quarters (3/4) of a mile. At the crest of the hill, just after the pavement becomes a gravel road, turn right into the driveway, number 196 rang de la Montagne. You will see a large white and blue house there. The entrance (on the right) is marked by an arch with the letters "Kriya Yoga Ashram de Babaji".